Three different European realities, the three cities Dudelange (Luxembourg), Arezzo (Italy), Berlin (Germany), have been the starting point. Students exchanged with their counterparts via internet the nature and peculiarities of their environment and the architectural as well as economic and social characteristics of these cities. Their personal cultural heritage view has allowed an innovative angle. The participant pool has been three classes of students aged 15 to 17 years with one class per partner institution, with the collaboration of the École Nationale Supérieure d’Architecture de Paris Val-de-Seine. We realized distance learning activities as well as “on site” activities. Students have prepared interviews to gather useful information and deductive material. Imagery and film have been used to better reflect the “local” reality to partner students. Surveys have been distributed to assess the evolution of and changes in viewpoints, knowledge and opinions taking place during the project. The impact on the students has been an increased awareness of European cultural diversity and heritage, as well as an improvement in linguistic and ICT skills. The project encourages teachers to collaborate in a multidisciplinary approach and to embark on novel didactics of education projects. We hope that this Erasmus+ project will contribute to the academic development of didactic and ICT tools in education. 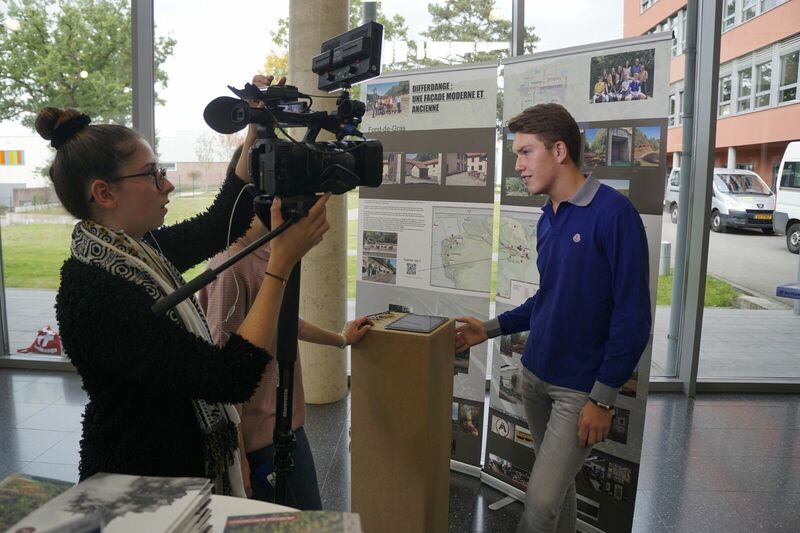 The project Erasmus+ “Patrimony – Landscapes – Perspectives” gravitates around meeting and confronting three different European facts, represented by three participating cities: Dudelange (Luxembourg), Arezzo (Italy), Berlin (Germany). The collaboration of the École Nationale Supérieure d’Architecture de Paris Val-de-Seine (France) is also included. Students were asked to exchange with their peers the nature and peculiarities of their city from an architectural, an economic as well as a social point of view. The lingua franca of the project was French. The projected impact for students was to sensitize them to European cultural diversity as well as an improvement of their linguistic and ICT skills. From the teachers’ perspective, the project was to encourage colleagues to collaborate in a multidisciplinary manner and engage in a new didactic of project-based teaching (education). Three on location exchanges with all participating students took place between Arezzo (May 2016), Berlin and Dudelange (school year 2016-2017). Outside of these encounters students worked together long-distance – that means virtually – in transnational teams, where each team had a specific task related to the global theme (patrimony – landscapes – perspectives). By means of collecting, prioritization and information interpretations exploring cultural and urban heritages, students were able to slowly build up a current vision and a vision for the future of the world surrounding them. A virtual platform unifies all of the sites students exploited. External visitors have free access to discover students’ various productions; some of which are written productions, videos, audio files, etc., all of which pertain to the larger narrative. On behalf of the teachers, this experience has helped refine pedagogical practices with ICT, which they can now actively share with their co-workers at their respective establishments.